Tourism NT is taking its social media campaign to the next level by hosting an industry first ‘Hypermeet’ to promote the Northern Territory’s Red Centre. Three of Australia’s top Instagrammers have been asked to attend the Hypermeet and share photos of their six-day trip from Alice Springs to Kings Canyon, before they visit Uluru on Monday. Instagrammers Matthew Vandeputte and Matt and Mia Glastonbury share a combined following of 175,000 Instagram followers and more than 1.3 million Google Plus followers. The three were chosen for their well-known use of the timelapse technique, where they speed up 900 images in a short clip. The technique has become popular with Instagram’s Hyperlapse app. The app allows users to accelerate up to 45 minutes of footage into a 15 second video. The Hypermeet is part of a broader campaign aiming to promote Alice Springs as the gateway to the Red Centre. Tourism NT Chief Minister, Adam Giles, said the Hypermeet is aimed at inspiring the 41% of Australians who have considered a trip to the Northern Territory but have yet to book a trip. 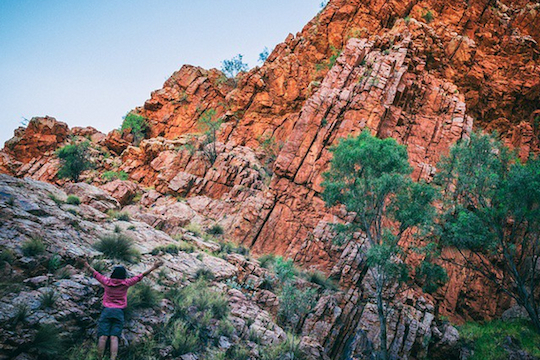 Tourism NT’s marketing efforts have supported a 14% increase in domestic travel to the NT and a 20% increase in expenditure for the year ending September 2014, according to the National Visitor Survey. “Developing this kind of new and industry-leading social media campaign is an important part of our marketing strategy. The endorsement of these influential third party advocates is invaluable,” said Adam Giles. In the past year, Tourism NT has used the Instagram app to promote the territory to much success. Adam Giles said the photo and video sharing platform has taken tourism marketing “by storm”. Users have been encouraged to use #NTaustralia to share their photos and videos of their experiences in Northern Territory. Since the campaign started last year, the hashtag has been used on over 40,000 Instagram posts. In May last year, Tourism NT hosted Australia’s first Instameet where seven well-known Instagrammers posted to their combined 800,000 followers from Darwin’s Mindil Beach Sunset Markets. Professional Instagrammer Lauren Bath has also been posting to her 380,000 followers as an ambassador of the ‘Mates of Territory’ program since the social media campaign started last year.